ColourPop just turned 3 in May and although I haven't been following them since the start, I'm glad I found them and I have loved their products ever since. I really only got on the ColourPop bandwagon last September and I have pretty much collected almost everything that they have to offer. To celebrate, they had some offers running like 3 for $10 eyeshadows and free shipping as well as free mini ultra satin lips. They also released a limited edition birthday swag bag filled with exclusive goodies. It came in this bag but it was packaged in a box. 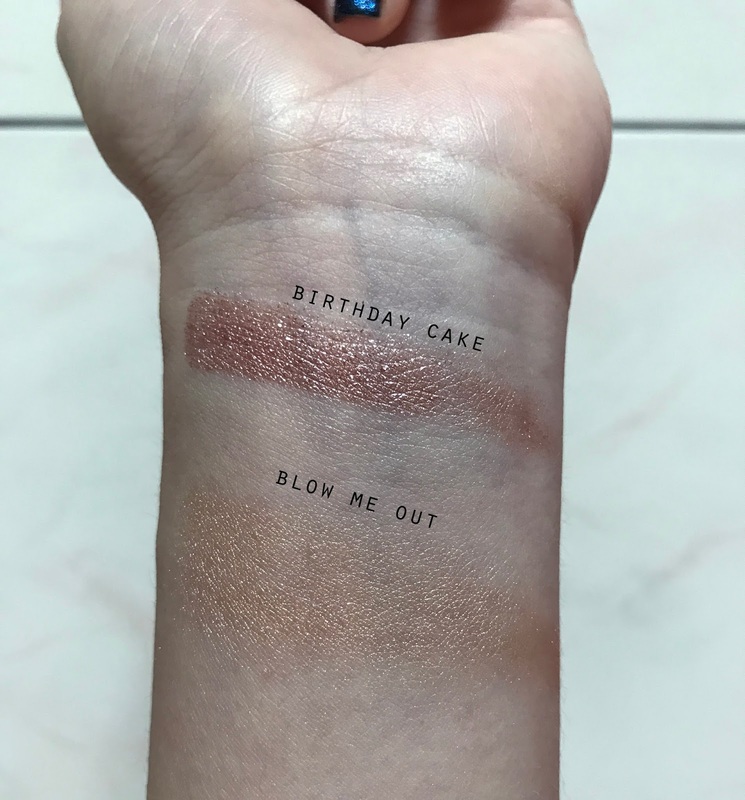 The Birthday Cake super shock shadow came free on orders over $10. Since the bag is $35, it qualified for free international shipping as well at that point in time. Inside the bag, there is a sticker sheet with some cute motifs like their super shock shadows, ice cream and stars. The packaging of the boxes are in a baby blue theme with stars. It says "Happy Birthday, Us" on one of the sides and there are some sprinkles on the interior of the box. The container of the super shock products has silver stars on it and it's in a reflective silver finish. Birthday Cake is a pink toned rose gold with chunks of glitter. It is in an ultra-glitter finish so yes, it is very sparkly and pretty. In terms of base color, it is most similar to Arrow but in terms of sparkle, it's very much like Sequin. Sequin is more copper toned as compared to Birthday Cake. It might also be a dupe to Stila's Magnificent Metals Glitter and Glow Liquid Eyeshadows. This highlight is very close to my skin tone and almost doesn't show up on my arm or face. It is a warm brown that is about 1-2 shades darker than my skin. It is also a subtle highlight with very minimal shimmer and no big glitters. In the pack, there were 4 pressed eyeshadows too and these are packaged in their standard sleeves. They definitely should have done a baby blue theme to match with everything else though. All the shadows are iridescent duochromes with quite a sheer base color but they look magical under low light. I think they function best as highlighters but you can really use them as you like. The shadows felt very smooth and really compact in their pans. There was no kickback when using with a finger or brush. They don't pick up very well with a brush unless you are using a really dense synthetic flat/packing brush. This is a white based iridescent shadow with a blue and green shift. I took pictures under natural light, low light and flash to show the different effects of the shadow. Top swatch is using fingers and bottom is using a brush. Rager is a pale yellow with a yellow-gold flip. Top swatched using fingers and bottom swatched using a brush. Party Favors is a peachy orange with a golden shift. Top is swatched using a finger and bottom is swatched using a brush. Cake Walk is a light lilac with a blue shift. Another magical unicorn color. The base color is very light as you can tell. Top shows a finger swatch and bottom shows a brush swatch. 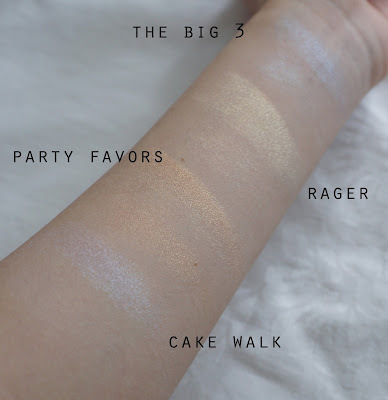 In these pictures, I am wearing Birthday Cake on the inner half of my lid for the sparkle, Cake Walk as my inner corner highlight, Rager as my brow bone highlight and Party Favors on my bottom lash line. It's not very obvious because my bottom lash line curves weirdly. The shadows look really nice against a black base as well. I layered it over ColourPop's black ultra matte liquid lipstick in the shade Friday. It really brings out the reflects of the shadows. The Ultra Glossy Lips are in the same baby blue packaging with stars and sprinkles on the inside. These have a metallic effect and two of them are duochromes. They are really iridescent/unicorn/mermaid kind of colors, much like the pressed eyeshadows, so it is very trendy of ColourPop. Bash is a glittery pink with hot pink glitter. The pigment is really sheer so it gives my lips a nice wash of color and sparkle. Layered over a black lipstick, the glitter really shines through and appears pink-purple. RSVP is a iridescent duochrome light pink with a greenish yellow shift. It's not glittery like Bash because the pearls are finer and it looks more metallic. Against a black lipstick, the green really shows through although it's a bit hard to ensure that the gloss covers everything evenly. Wishes seems to be the glossy version of Sandwishes, which is one of the new ultra metallic lips that they just recently released. This is a fuschia pink with a blue-purple shift. Since it's a sheer color, it doesn't come off as a hot pink on my lips but it does add a nice touch of rose pink. On top of a black base, it looks like a metallic deep navy blue - beautiful! Did you grab the swag bag in time? It's discontinued now but if they ever bring the items inside bag, I do recommend picking up the shadows because they are really unique and in trend right now. Lip glosses are also making a comeback and these make beautiful lip toppers so you'll definitely have fun playing with them. However, the lip glosses will break down the lipstick underneath if you are using a matte liquid lipstick. So, if you happen to eat or wipe off a part of it, it might remove in patches.